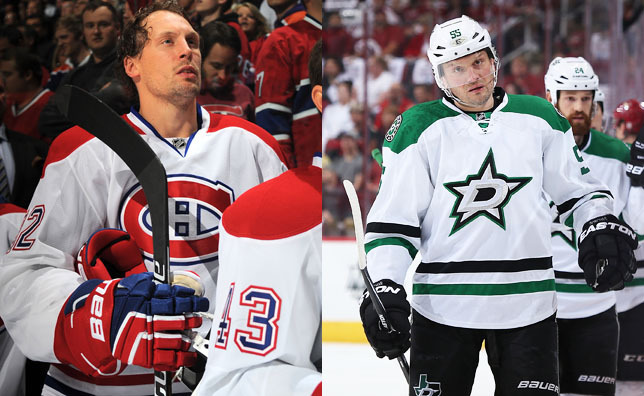 MONTREAL – Montreal Canadiens general manager Marc Bergevin announced Tuesday the acquisition of defenseman Sergei Gonchar from the Dallas Stars, in return for forward Travis Moen. A native of Chelyabinsk, Russia, Gonchar was selected in the first round, 14th overall, by the Washington Capitals at the 1992 NHL Entry Draft. In his NHL career, he played for the Capitals (654 games), the Boston Bruins (15 games), the Pittsburgh Penguins (322 games), the Ottawa Senators (186 games) and the Stars (79 games). Gonchar was selected to the NHL Second All-Star Team in 2002 and 2003. He also played in the NHL All-Star Game four times (2001, 2002, 2003, 2008). He suited for Russia in four Olympic Winter Games (1998, 2002, 2006 and 2010). He won the Stanley Cup with Pittsburgh in 2009. The 32-year old Travis Moen was scoreless in 10 games with the Canadiens thus far this season, averaging 10:29 of ice time per game. The Stewart Valley, Saskatchewan native played in a total of 328 career regular season games with the Canadiens since joining the team as a free agent on July 10, 2009.